The great Italian composer, although agnostic himself, vividly depicts the desperate pleas of mankind for salvation in face of terrifying forces unleashed on judgement day. Sometimes described as ‘Verdi’s greatest opera’ the scoring for soloists, chorus and large orchestra remains intensely dramatic from the searing trumpet calls that waken the dead to an ending prayer for eternal rest. Fittingly, the soloists taking part have strong connections with the world of opera. Tenor James Edwards has appeared at the Royal Opera Covent Garden, English National Opera as well as theatres in Paris and Salzburg as part of a growing international career, while bass-baritone James Oldfield holds the 2010 Leonard Ingrams Award from Garsington Opera and has made regular concert appearances with the major London orchestras. Elizabeth Sikora, mezzo soprano, is a frequent soloist at Covent Garden, but has also sung at La Scala, Milan, in Geneva’s Grand Theatre and at the Netherlands National Opera. The soprano Kiera Lyness – charged with performing the Requiem’s moving final Libera me – has also performed solo at Covent Garden, where she is a member of the chorus and is part of the successful ‘House8’ octet formed by Royal Opera singers. 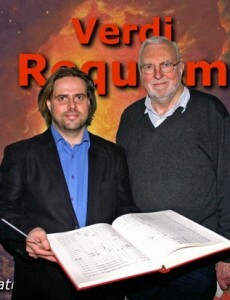 The St Albans performance of Verdi’s masterpiece will be under the baton of Bjorn Bantock – the first time he has conducted a major choral work with the orchestra since becoming its principal conductor eighteen months ago. The Requiem will be repeated a week later in Watford led by Terry Edwards, the Watford Philharmonic’s conductor (7.30pm, Watford Colosseum, Saturday March 17th). Tickets: £20, £16, £12 and £8 (£1 under 18s, £5 students) from SASO’s Ticket Secretary (01727 857422), the Abbey Box Office (01727 890256) or via www.saso.org.uk.